As America continues to grapple with its ongoing racial tensions, artists from all genres have expressed their their individual angst with the constant police brutality happening in predominately black and brown communities across the country. Artist Michael D’Antuono unveiled a new portrait titled “It Stops With Cops,” which will be on display at the inaugural Politicon, a Comic-Con of sorts for politics, in Los Angeles October 9th and 10th. The vivid portrait depicts a police officer gripping the end of night stick being held by another cop about to beat a handcuffed black man. 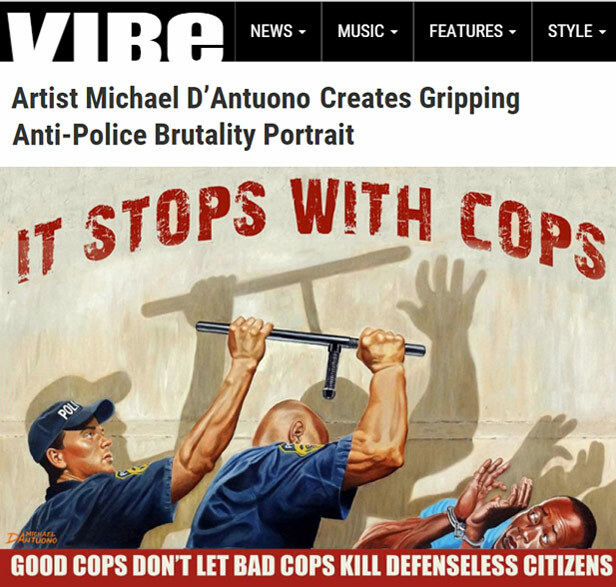 D’Antuono is quick to remind people this portrait isn’t anti-police, rather anti-police brutality and anti-institutional racism, and hopes the painting will help offer courage to cops who stand by silently while their colleagues break the law.